The "Stone Earth Pan" (non-stick, induction ready, 12" frying pan) arrived from Amazon today. And it looks like we have a week of completely clear skies so the batteries can recharge. Almost the same ingredients except for olive oil instead of butter and I added some cherry tomatoes. The pan seemed to take longer to heat up but that could be due to its larger size. Before starting, the Trimetric monitor read -10.2 amp-hours meaning that the battery bank was still not completely charged from the crock pot test. The ham, onions and mushrooms were partially cooked and removed from the pan. 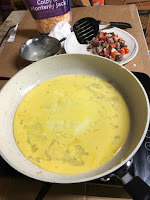 The scrambled eggs (with a little cream added) were put into the pan. After they set, the filling and some colby jack cheese was added. heat distribution wasn't even as the edges were cooking slower than the center. 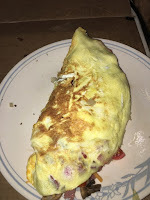 The completed omelette was rolled out of the pan onto a plate. No sticking at all. The stone-derived non-PFOA coated pan was non-stick as advertised and the claim is that no harmful substances are ever released. Here is the completed omelette. It more closely resembles an omelette and I remembered to take a picture. 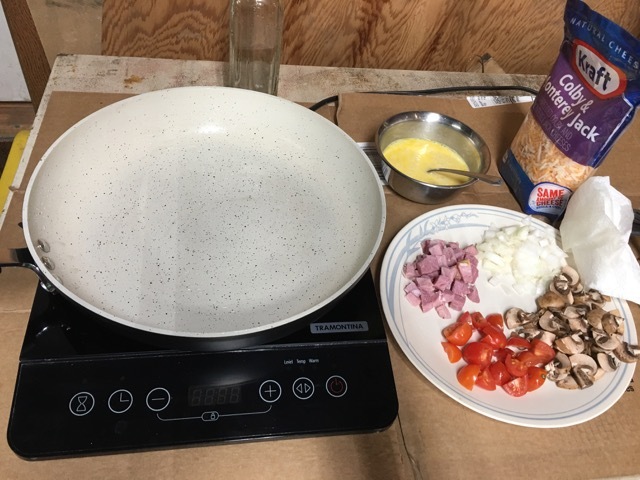 The Trimetric read -20.3 amp-hours indicating that I had consumed 10.1 amp-hours to prepare the omelette. Peak current from the battery bank was ~74 amps when the induction burner was set to 1000 watts. I know some may not get too excited by a frying pan but the lack of a non-stick pan was preventing me from getting more use out of the induction burner. It looks like the panel is putting out 7.4 amps on this nice sunny day. Maybe the bank will finally be back up to 100% in a couple of days. That omelette looks good to me! It turned out fine. I was more curious how well the pan worked on the induction burner and if it was really non-stick. I'm sorry for my ignorance, but does that mean it took 10 hours to get enough solar power to make one omelet? What is 10.1 amp hours? Battery capacity is measured in amp-hours. We will have 430 amp-hours of capacity and but only half of that is useable or around 215 amp hours. I am curious how much of that capacity is used by routine tasks such as making an omelette or a cup of coffee, watching TV, charging up a laptop or phone, the CPAP machine, etc. This would give us a good estimate of what can be used when not in a campground with power. So 10.1 amp-hours is 4.6% of our useable battery capacity. Other ways to think about is that it's slightly less than 2 cups of coffee or about 3 hours of the CPAP machine or the TV. There will be a meter on the wall showing amp-hours expressed as a percentage remaining. And, those two Champion generators can let you run everything, same time, during extended cloudy periods! Thank you. It turned out alright. The non-stick pan will definitely make the induction burner more useful to me.